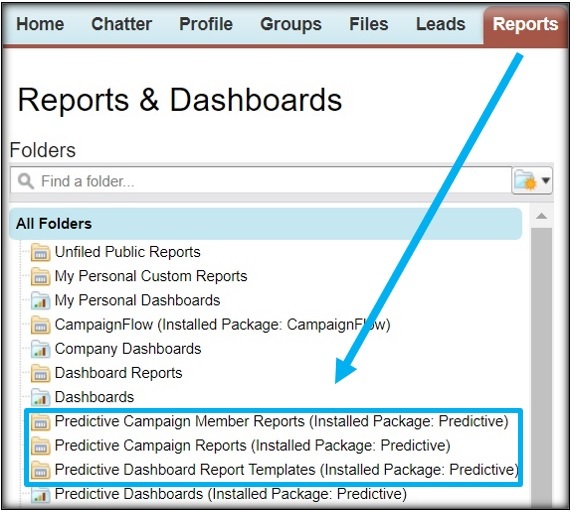 Predictive Campaign Member Reports: These reports provide information on member activity, scoring and more. 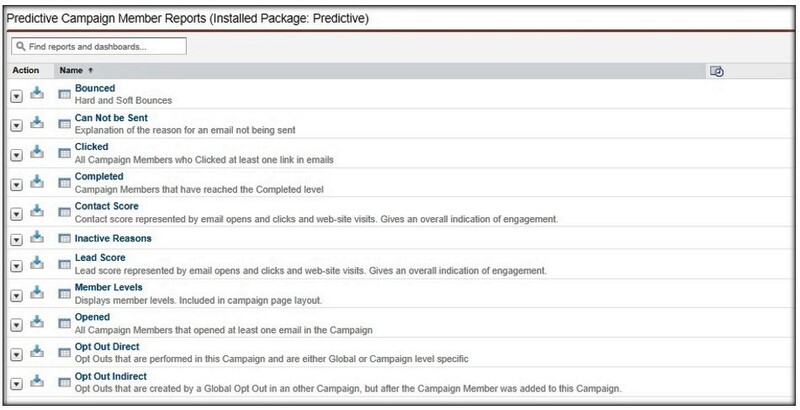 Predictive Campaign Reports: These reports provide information on campaign progress. 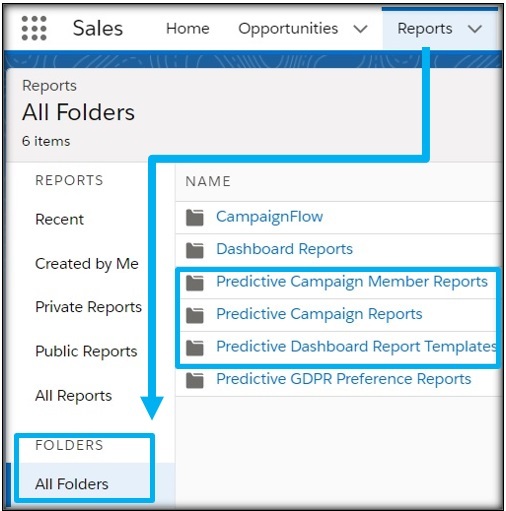 Predictive Dashboard Report Templates: These reports provide a summary of campaign information. These folders are accessed from the Salesforce Reports tab. You also have the option to customize the provided reports to your liking. Step 1: After clicking on the desired report, click the ‘customize’ button. Step 2: Use the ‘filter’ drop down to add any filters desired, below you can click remove to delete any. Step 3: Use the ‘show’ drop down to select your campaign(s) view. If choosing a specific campaign, use the ‘select campaign’ to search for your campaign. Step 4: Adjust the ‘Preview’ section to show your results in the desired format, default is summary. Step 5: Adjust the field columns as desired. You can remove fields from the report preview by clicking on the field column and dragging it back to the left navigation bar. Step 6: Once you have the report customized to your liking, click the ‘Save As’ button to save it for later use if desired. Follow the prompts to name the report and choose the folder to save it under. Step 7: Run the report to pull the current data. This can be done prior to step 6 if desired. Either from the customization screen or the completed report screen you will find the ‘run report’ button. Click for more information on customizing Salesforce reports.